The translocation of the five lions from the Kunene region takes place in November. It is not until mid-December that the Ministry of Environment and Tourism (MET) confirms rumours that they have been released in the Erongo Mountains. They would be constantly monitored there, says MET. The EMRS stresses that it has agreed to this, in accordance with a fundamental decision by its members at the 2015 Annual General Meeting. The related farmer families van Alphen and Kayser, who have a campsite on Farm Eileen in the Erongo and according to EMRS also keep goats, strongly object. They demand that the lions will be caught again and taken elsewhere, as there are hiking trails in the Erongo Mountains and tourists would be at risk because of the free-roaming cats. They further claim, that a constant monitoring of the lion would not be possible as they wear no collars. 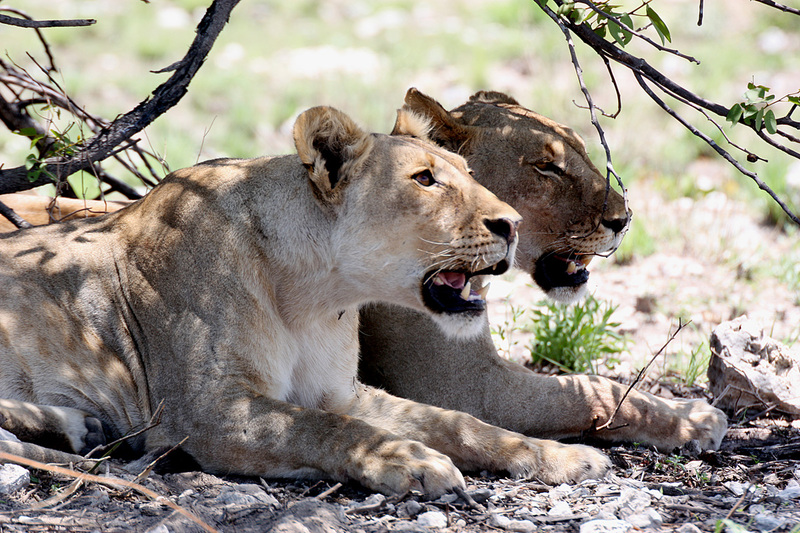 MET announces shortly thereafter to relocate the lions – probably to Etosha. The professional hunting association Napha points out that they are young lions. As Etosha has an over-population of lions, the packs living there would regard them as invaders and kill them. On the other side the EMRS is 180,000 hectares in size and can carry at least 20 lions sustainably due to its game population. In mid-January, with the assistance of Bush Telegraph, the EMRS publishes a detailed media release stating that lions pose no threat to humans as they generally avoid them. There are fewer known cases of attacks on humans by lions than by leopards, which roams the Erongo Mountains. The EMRS wants to provide the lion with habitat outside the national parks, because it is acutely threatened by the increasing spread of man. Its habitat shrank to eight percent of its original range. According to the EMRS, its area is ideal for lions, while it is not suitable for sustainable farming. 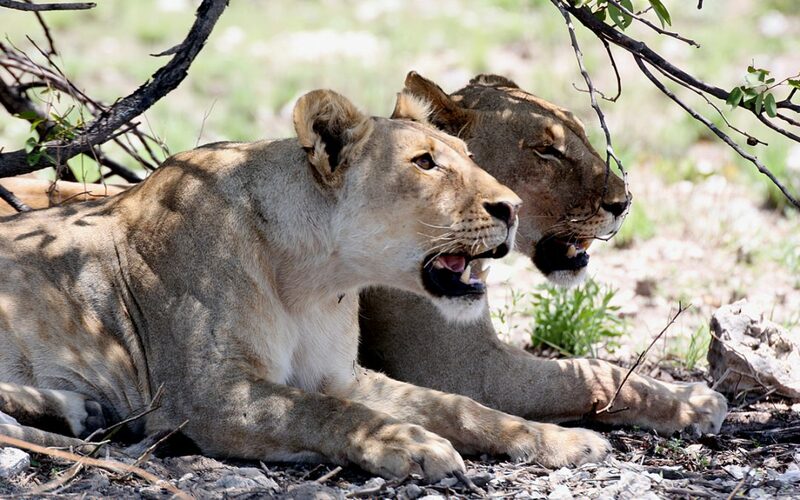 In addition, the EMRS emphasises that the lions have not been seen in the Erongo since their release and are only killing game – which confirms that they had targeted livestock in the Kunene region only because game is scarce there due to the drought. Apparently, despite intensive search the capture team of MET in Erongo does not manage to track down the big cats. Up to now there were no reports about their capture. • The EMRS has supplied the media with a flawed map, not reflecting the actual boundaries of its area (see divergent map). • When the lions were released, the applicable rules had not been complied with. • The Erongo mountains were never home to lions because there is generally too little game. • It is indeed possible to farm sustainably in the Erongo mountains, as their farms prove by existing for decades. • In the Omaruru Schlachterei (butchery) there is a petition against free roaming lions in the Omaruru area; copies will be handed over to the Namibia Agricultural Union (NAU) and MET in the near future. 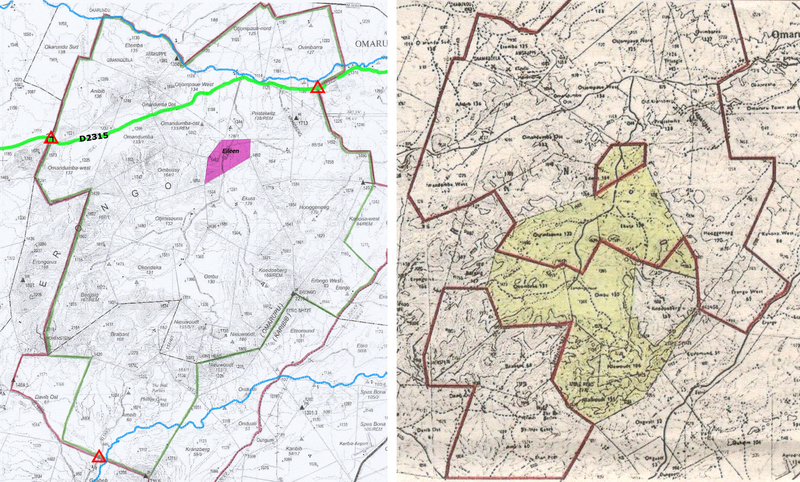 Diverging maps: On the left the map of the EMRS (Farm Eileen marked pink), on the right the map of the protesting farmer families (as published by Allgemeine Zeitung on 1/02/18 on p. 8: Borders of the EMRS marked red; farms marked yellow are against free roaming lions).